Ashley Holmes is the daughter of Jacqueline Laurite. Both mom and daughter appear on a popular reality show named “The Real housewife of New Jersey. After releasing her new pictures in the last two or three months, it seems that she is a tad different than before. Some of her fans and readers of magazines as well pointed out that she had undergone some sort of plastic surgery. Actually, her mother buys her everything that she wants. At the age of 19 her parents bought plastic surgery for her nose. She has undergone a rhinoplastic surgery and updates a bandaged up photo of her nose on her Facebook. This photo has proved that she underwent through her nose job surgery. In fact, her parents make it possible that her daughter seems pretty and perfect after having a plastic surgery on her nose. It is worth to mention here that unlike many other celebrities who have improved her nose through rhino plastic, Ashley Holmes nose job is the combination of Septoplasty and rhino plastic; that is called septorhinoplasty. 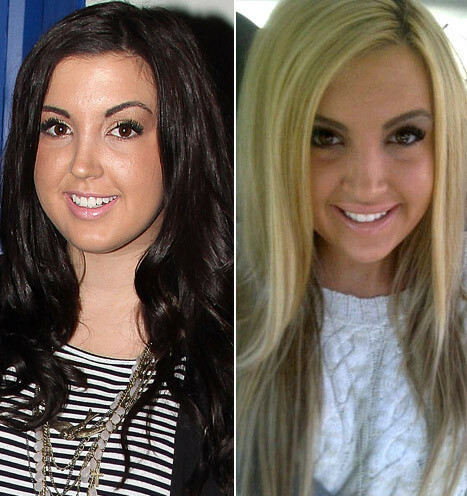 This nice nose job surgery of Ashley Holmes improved her look in a beautiful way. But this nose job also made her nose much shorter as compared to the previous one turning her nose look pudgy and around. So, she took a facial enhancement and lip injections to improve it in 2012. She also dyed her hair completely that made her unrecognized and she became slimmer as well.